This tour gives you your very own kabuki guide (a geisha who has studied kabuki music for more than a decade) to explain the history and evolution of this unique stage art. You will appreciate the performance to a greater extent after learning of the finer points and background of the play. We will watch one section of a kabuki play and have some time before hand or afterwards for a coffee to talk about the background of the play, the training of the actors, and the music in the theatre. Please be aware that kabuki does not normally run on the last five days of the month and the exact days differ slightly month to month so if your desired date is around this time let me know before booking. It will normally be at the Kabuki Theatre (〒104-0061 東京都中央区銀座４丁目１２−１５, 4-12-15 Ginza, Chuo-ku, Tokyo, near Higashi Ginza station). We can give you instructions on how to get to the Kabuki Theatre from your hotel. Kabuki is one of the four traditional Japanese stage arts. 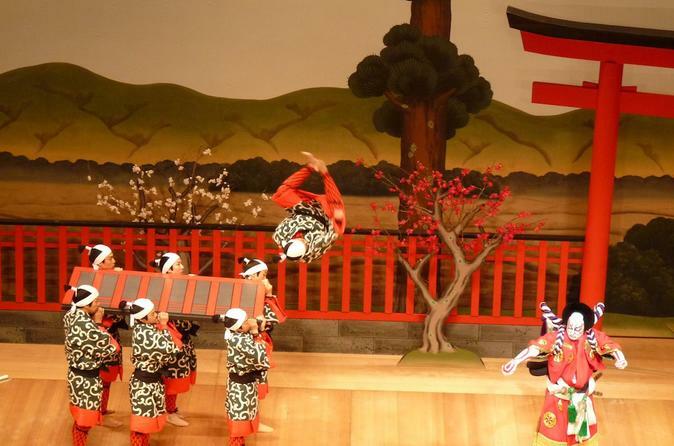 It originated in the 17th century and was first performed by female dancers though current-day Kabuki has only men. Its highlight is the stylized acting, costumes and grand scale. The most memorable points are the revolving stage and makeup worn by the actors. We will be watching one of the segments of a kabuki play or dance, about 1 to 1 1/2 hours in duration, depending on the play. Sometimes we will be able to watch a one hour play followed by a half hour dance. The program changes monthly. This tour will be run by Sayuki, the first westerner to become a geisha in Japan. She has been studying the music of the kabuki theatre for a decade and she has lectured in Japanese Studies at both Keio and Waseda Universities in Japan for nearly ten years. She will be able to give some insight into the background of the kabuki theatre, and the specific play being shown, and the artistic traditions behind the plays. Your guide Sayuki will help you understand the background of the kabuki theatre, and the context of the play we will see.